*Disclaimer: We received the Ozeri 12″ Wok free of charge for the purpose of reviewing. All opinions contained within this post are our own. 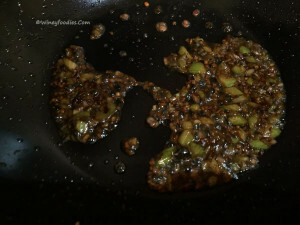 We were excited to learn we would have the opportunity to review the Ozeri 12″ Green Earth Wok from Moderna Housewares. 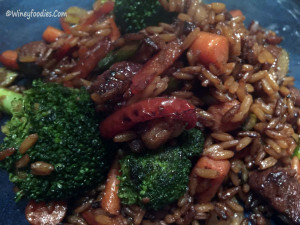 We had been using a Carbon Steel Wok for our stir fry, however we had problems with food sticking to the pan. 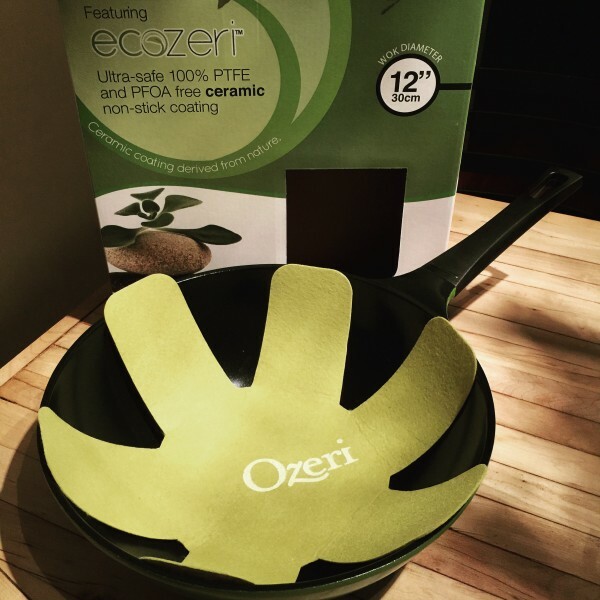 We were interested to see how the Ozeri Green Earth Wok would perform as it has a non stick, ceramic coated inside, and a heavy gauge die-cast aluminum base. 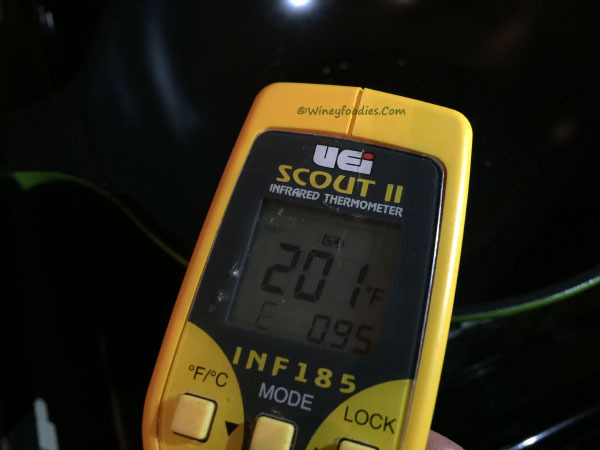 After using the Ozeri 12″ Green Earth Wok every day for two full weeks, we are extremely happy with the results. We have cooked everything from sautéed vegetables and stir fry to spaghetti sauce and omelets. 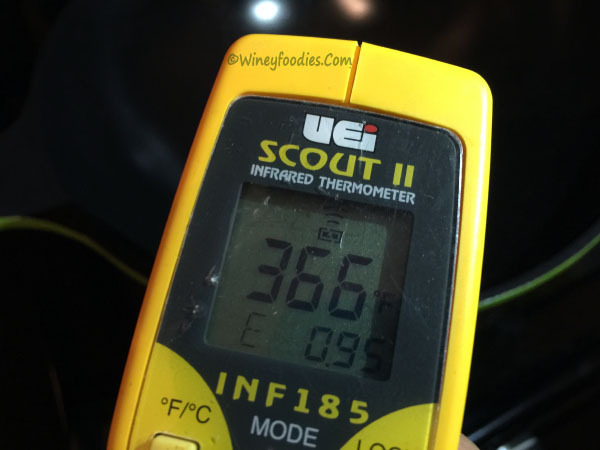 The pan gets very hot fast, and heats evenly on all sides (see our heating test below). 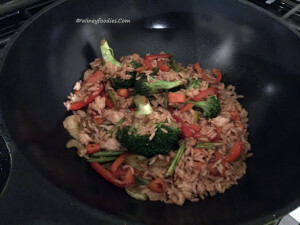 We found the Ozeri Wok worked best on medium heat. Absolutely nothing sticks to it. Nothing. Maybe if you let the pan sit on high heat for a long time without stirring something will stick to it; but we have not had trouble with food sticking to this wok. Cleaning is pretty easy – you simply wipe it out with a soft soapy cloth. The instructions state you can use the Wok in the oven up to 350 deg (we have not attempted to bake in our Wok). The directions are thorough, however they are typed in a small font and are hard to read. The outside is a painted surface and not as easy to clean. This is only a problem if you spill food on the outside while over heating the wok. 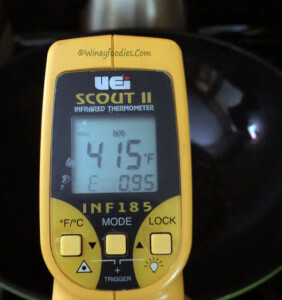 As we mentioned above, this wok gets very hot, fast. So we decided to do our own test to see how hot the wok would get and weather it heated evenly on all sides. 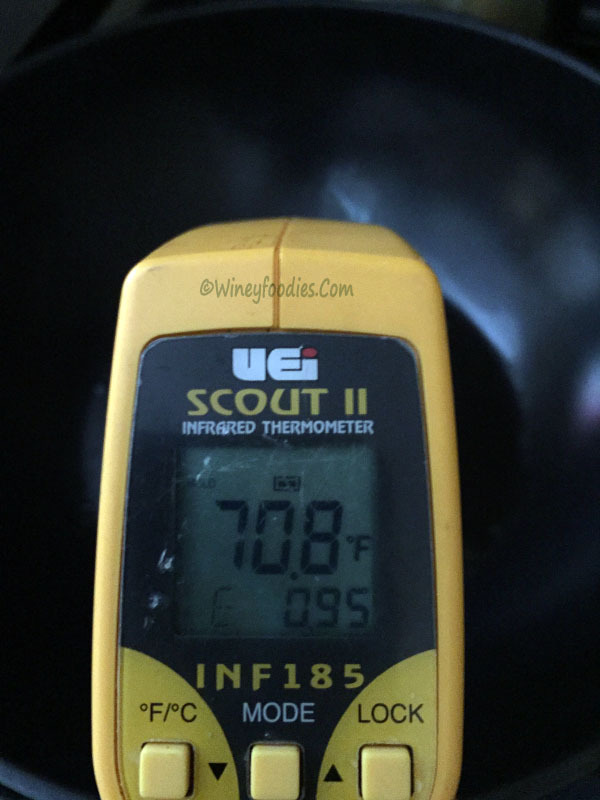 We have a point and shoot thermometer that allows us to take the temperature of most any surface. *Our stove is a standard whirlpool gas stove. The heating time will be different depending on the stove. Surface Temperature after 35 seconds medium heat. 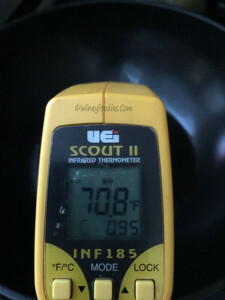 Temperature at about 2 minutes 10 seconds on medium heat. Watch the temperature. Remember, this wok heats up very fast so lower stove temperatures may work better for most recipes. You only need to use 1/4-1/3 of the amount of cooking oil or butter that is sometimes needed in other pans. We used a little too much oil one night when sautéing vegetables and the items did not brown as fast. Best used with a medium to high heat oil. We used Sesame oil or butter on medium heat for all of the dishes we cooked. Do not use metal utensils or abrasive cleaning products. We found the ceramic coating to be durable, however the use of improper utensils may scratch the surface. Use bamboo or nylon utensils for stirring in the Wok. Do not allow the Wok to boil dry. Let the pan cool completely before rinsing with cold water. Cleaning: This Wok is easy to clean by wiping out with a soft wash cloth. Overall we are very happy with this Wok. We especially like the “no stick” surface, fast heat time, the feel of the handle and wok when using, and how easy it is to clean after use. It has become our everyday cooking pan. 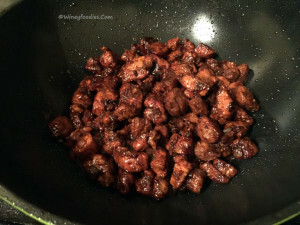 Cooking, Recipes, Reviews, Wok. Bookmark. This sounds great. i love Thai food. I have an Ozeri skillet that I adore! Thanks for the giveaway. We have been using it to cook everything! I am considering adding more cookware from the Ozeri line and getting rid of some of my old scratched up pans. I would love to try Ozeri cookware because it’s non-stick and non-toxic. This would make a great christmas gift for my daughter. I love this earth wok! It’s been years since I had a wok to cook with. This one sounds and looks awesome! I have never cooked on a wok, but would love to try it.